Last Saturday was a day to remember for Frendsbury Gardens as all the hard work by local residents done over the last few years paid off as the garden was awarded a community garden Green Flag award. 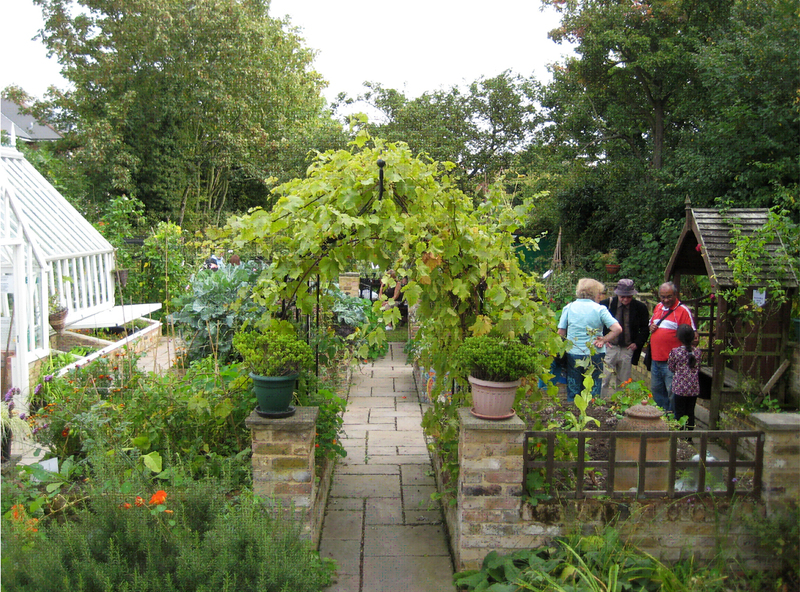 The community gardens located on Frendsbury Road in Brockley was once a derelict area of land which suffered from fly tipping and over grown vegetation. Thanks to funding from the Big Lottery Fund, Lewisham Council, Family Mosaic Housing and the South London and Maudsley Trust, the site has been transformed and is a hub for community activities such as story telling, creative workshops, bug clubs and food growing. 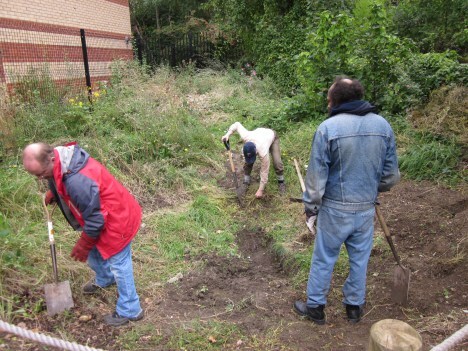 Natures Gym volunteers digging out the pond in 2011. Green/Community Green Flag Awards are a national scheme, given to recognise the best green spaces. Lewisham has been awarded a total of 14 Green Flag Awards and 4 Community Green Flag Awards. Other sites in the borough to have received a Green Flag Awards include Cornmill Gardens, Sydenham Wells Park and Telegraph Hill Park. Frendsbury Gardens as it is today. Saturdays event was a well attended fun event with arts and craft, story telling and cooking! Cllr Wise and Cllr Millbank came along to congratulate the hard work of the steering group and its volunteers and the celebrations climaxed with the raising of the flag by the Mayor of Lewisham- Sir Steve Bullock. Chefs from Marmalade Mondays @ the Hill Station cooked up a feast from veg picked by the children.. 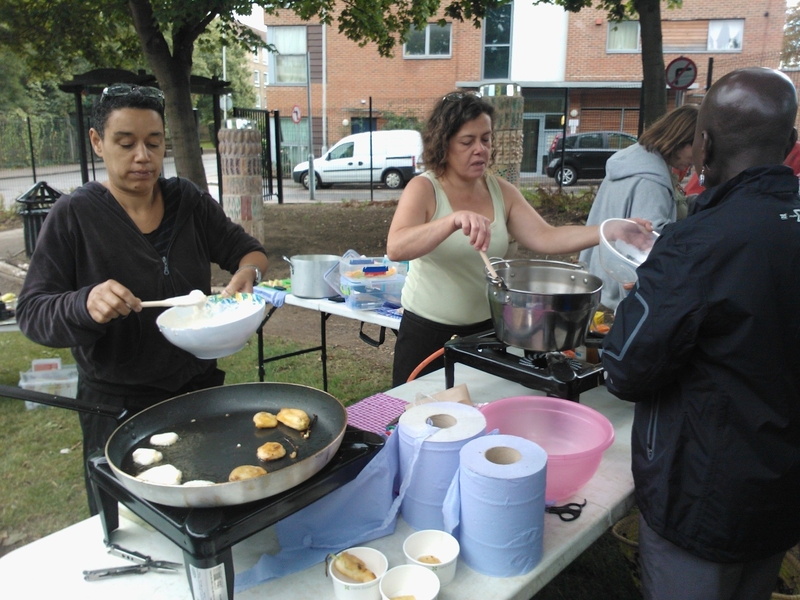 Categories: community engagement, composting, Environmental Campaigns | Tags: community garden, Community Gardening, community gardening in Lewisham, community gardens, Frendsbury Gardens, gardening skills, Hill Station, Marmalade Mondays, volunteering | Permalink. The upper limit for any award is £750.00. Deadline for applications: will be accepted until 30th April 2012 and there will be two funding rounds. Round 1 will open on 7th November 2011 and will close on 13th January 2012. Round 2 will open 1st March 2012 and close on 30th April 2012. Categories: community engagement, composting, Environmental Campaigns | Tags: community engagement, community funding, community garden, community gardens, fruit and vegetables, growing food, growing veg | Permalink. This year the Borough has added to its Community Green Flag Awards, from 2 to 3. Grow Mayow joined Devonshire Road & Grove Park Nature Reserve in being awarded this accolade. Next year we are planning to win 5 as the Sydenham Garden Project and The Friends of Albion Millennium Green have agreed to work in collaboration with Green Scene to prepare their applications. We are certain that they will both achieve a high score for this Award as their site and work is truly inspirational. Categories: community engagement, composting, garden waste | Tags: community garden, Community Gardening, Community Green Flag Awards, composting, Gardening in Lewisham, Green Scene, Grow Mayow, Sydenham Garden, Sydenham Garden Project | Permalink. Community Gardens – Growing Strong! 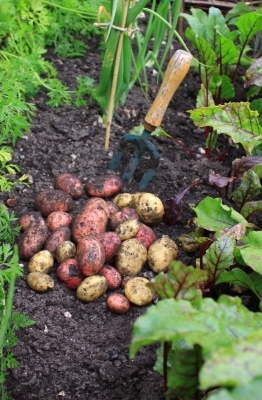 The community garden scheme has exceeded its target of helping to create 60 community gardening projects in the borough by 2012 . There are now 62 gardens registered with Capital Growth and includes our own staff contribution – ‘Box Clever’ using old recycling boxes to grow vegetables, herbs and lavender at the Wearside Depot. I’m sure the local bees in the nearby hive will also benefit from these. However, we will continue to encourage community gardens and gardeners in the borough through the small grants scheme, capacity building, supporting with the legal processes for council owned land and the facilitation of a forum for community gardens in the borough. 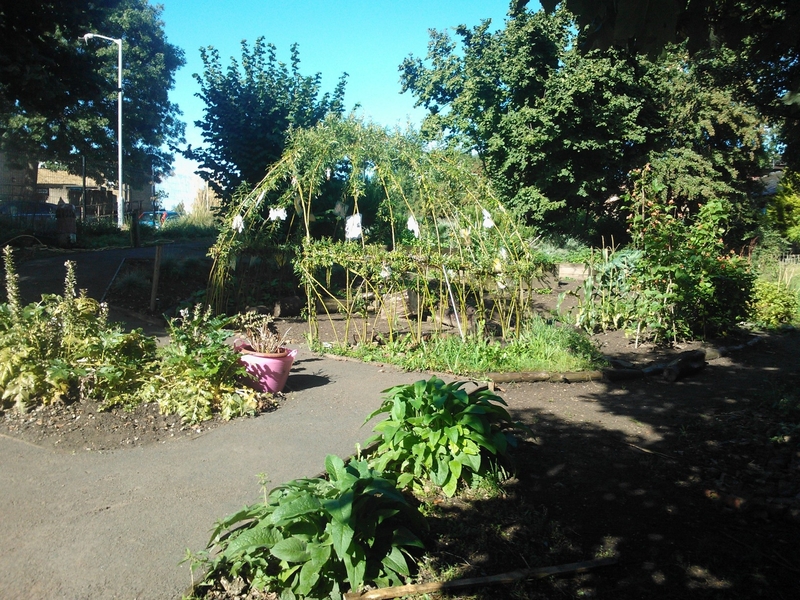 The photo below is of ‘Common Growth’ a community garden located inSandbourne Road. If you would like further information about Community Gardens, please contact Stella Agunabor via email stella.agunabor@lewisham.gov.uk or call 0208 314 2068. Categories: community engagement, composting, garden waste | Tags: community engagement, community garden, compost, compost bins, composting | Permalink. Next week is Climate Week – a national occasion that offers an annual renewal of our ambition and confidence to combat climate change. It is for everyone wanting to do their bit to protect our planet and create a secure future. Thousands of businesses, charities, schools, councils and others will run events during Climate Week on 21-27 March 2011. They will show what can be achieved, share ideas and encourage thousands more to act during the rest of the year. You can find out more about the campaign, including how to get involved by visiting the Climate Week website. There are also a number of events happening in Lewisham which you can get involved in … you can visit our own recycle map to see the location of these events – look for the orange suns! or the Climate Week website to find your nearest one. the winner of our Climate Week competition will be announced. Climate Week sees the launch of Lewisham’s Carbon Compact supporting delivery of the borough’s target of a 40% reduction in carbon emissions by 2020. Schools, colleges, businesses and organisations across Lewisham can take part in the biggest ever live environmental competition – the Climate Week Challenge, Monday 21 March. Lewisham Schools are taking part in their own ‘Earth Hour’ from 2 – 3pm on Friday 25 March. Thursday 24th March 10.30 – 3.30 pm. Learn how to reduce your carbon emissions by reducing waste. Sainsbury’s car park, Southend Lane. Sunday 27th March 1 – 4pm. Get a free garden compost bin and learn how to make your own compost. Dacres Wood Nature Reserve. Categories: community engagement, composting, Environmental Campaigns, recycling, reuse, waste minimisation | Tags: carbon, climate week, community garden, composting, love food hate waste, reduce, reuse, waste minimisation | Permalink.